When are owners thinking of selling their business and what are the challenges they face when preparing to sell? These questions and others were answered during a NASGW sponsored webinar conducted by Growth Strategy Partners, Munitions Law Group and The Hickory Group. Growth Strategy Partners outlined how to maximize the value of your business and prepare it for a sale. The Hickory Group outlined the sales process and how to make the sale as efficient as possible and Munitions Law Group outlined the legal requirements and needs during the sale. During the presentation, attendees were asked when they were planning to sell their business. 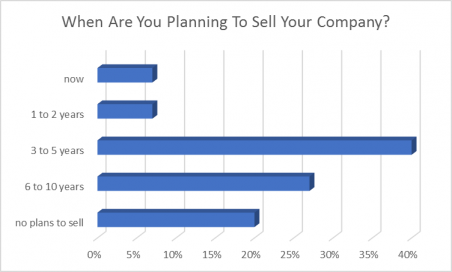 The majority of attendees, 40%, are planning to sell in 3 to 5 years followed by 27% in 6 to 10 years and 20% with no current plans. See the chart for the results. 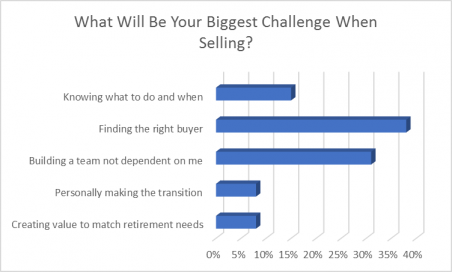 Attendees were also asked what their challenges are in preparing for a sale. 38% indicated Finding the right buyer while 31% identified ‘Building their team so it’s less dependent on the owner.’ A smaller percent, 15%, identified ‘Knowing how to sell it and when’ as the challenge. The full results are shown below. The webinar was recorded and can be found through this link. Munitions Law Group (“MLG”) is a hybrid boutique/full-service law firm that handles matters – exclusively – for clients in the shooting sports industry, both in the United States and internationally. To learn more about MLG, visit www.munitionsgroup.com or contact Clay Cheshire at Clay@MunitionsGroup.com or 404.941.2908.